On occasion, I get to post family pictures to my blog. This one is noteworthy, as my son Andy just graduated from high school. 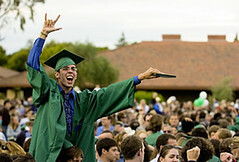 As the Palo Alto Weekly put it (and put the picture on the cover of the paper): "Andy Fruchterman jumped up on a friend's shoulders to celebrate among the throngs of graduating seniors and their loved ones at Paly."